The man is charged with the attempted false imprisonment of the teenager in the Ferbane area last week. 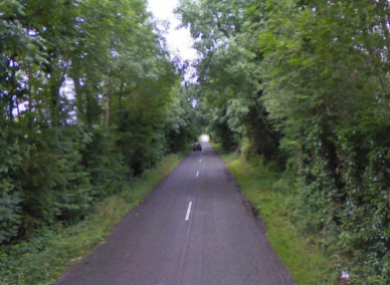 The road between Ferbane and Clonlyon where the incident took place. A MAN IN his forties has appeared in court in connection with the attempted abduction of a young girl in Offaly just over a week ago. The man was arrested in Tramore in Co. Waterford yesterday and was questioned at Tullamore Garda Station. This evening he appeared in court in Athlone and was remanded in custody to appear before Cloverhill District Court next week. He was charged with the attempted false imprisonment of the girl, who encountered the driver of a white van while she was cycling from her home to a friend’s house at Moyclare, near Ferbane in Co. Offaly. She said that the driver tried to pull her into the van, but she escaped after a struggle and raised the alarm. Neither the teenager nor the man have been named. Email “Man appears in court over attempted abduction of Offaly girl ”. Feedback on “Man appears in court over attempted abduction of Offaly girl ”.